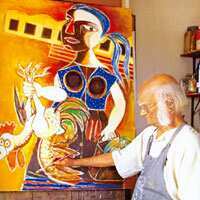 Nemai Ghosh was an ardent chronicler of the film-maker Satyajit Ray at work when, in the late 1960s, his lens happened to encounter the visually impaired master Benodebehari Mukherjee painting. Ray was filming The Inner Eye, a documentary on the artist, which was completed in 1972. Ghosh, 68, says in a candid introductory note to the book, “Every artist I photographed had a unique style...I realized that art was not estranged from reality but grew out of everyday life and activities." These words sum up the primary purpose of the book, but the large portraits convey more. By forcing readers to look at the details of the artists’ daily environs and imagine their roles in the creative enterprise, the portraits add to the mystique and charisma of each artist. For a few years after Mukherjee allowed him access to his studio—which, Ghosh says, was a dark room where Mukherjee painted, depending entirely on his sense of touch—Ghosh pursued his passion in Kolkata. Access to artists’ studios was restricted. 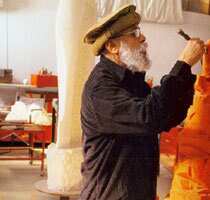 Many years later, he met Delhi-based art historian Ina Puri and artist Manjit Bawa in Kolkata, who were enthused by his idea. A mammoth project began in 2003 to document artists from all over India. Says Puri, the editor of the book, who later convinced Sunaina Anand of Art Alive to fund the project, “I met Ghosh when he was at an all-time low creatively. But he convinced me instantly. For the last three years, we’ve been convincing artists, deciding what to include and discussing production details." For the reader unfamiliar with Indian art, an introductory essay on modern Indian art by Sen helps place the featured artists in their historical context. Each set of portraits has profiles of the artist by Sen or Puri, making it easier to understand the life that each portrait contains.